Since my post about coconut ice cream some time I wanted to do coconut ice block like my mother used to make, and it is only now that I’ve been able to do it. I remember those days when we used to run a small parlour at home and together with sucker bag, kurma, tamarind ball and red mango was Mr. ice block. It was simple to make with lots of milky goodness. And, the most popular flavour readily available was coconut. Coconut milk, condensed milk and mixed essence was a match made in heaven…. It was such a joy to have an ice block or two….. or four or five on those sultry days that it could have been called a natural ritual in which all Trini children gladly participated. (And me, I was dey right in de middle meh with glass ah ice block in hand)…. Half melted in your glass or saucer, I would hurriedly eat mine before it was fully melted. But if it did melt, I wouldn’t mind because I would have a nice coconut milk drink instead (lol)! Most times it wouldn’t even get time to melt hahaha! ……………….And, no I wasn’t greedy! Are you ready to make coconut ice block? 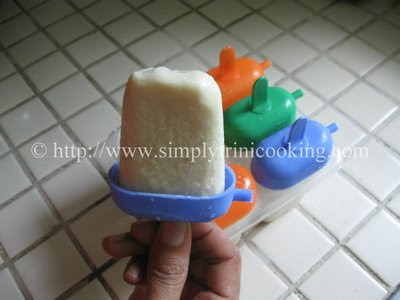 Here’s Coconut Ice Block: a childhood snack I truly enjoyed. Blend the ingredients together, until smooth. 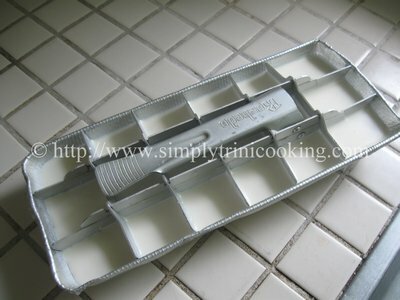 Pour the milk into ice trays and freeze. 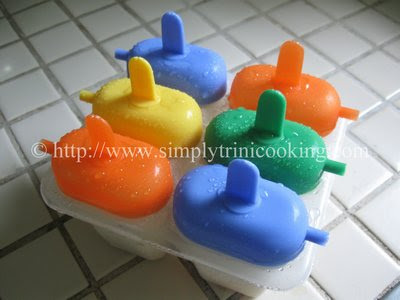 As an alternative you can use a Popsicle ice tray like the one shown here. Children will absolutely love these! So, this was a very easy recipe just mix, pour, freeze and enjoy. More recipes to come. Ah gone! 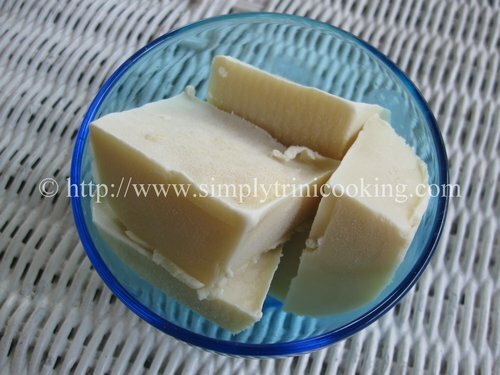 Don’t forget to leave your comments about this coconut ice block recipe in the comment box below. For those of us living in U.S., any suggestions for mixed essence substitute? I cannot believe how much you and I think alike. 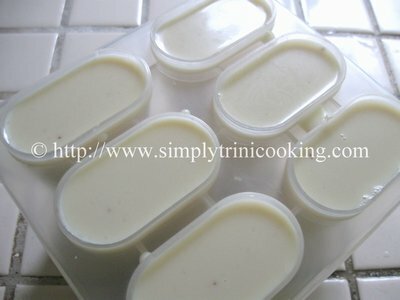 Just 3 weeks ago I wrote about custard blocks that we make in Guyana and I even used the same moulds that you have, only thing I don’t have a metal ice tray. Can I get metal ice-trays to buy in T’dad? I prefer them because they make the custard blocks and flutees a lot harder and faster than the plastic ones. You have not seen or heard me lately because I am overseas. Will write as soon as I can catch my breath. Hope that you and the family are well. @ Cynthia So nice to hear from you somehow I felt that you were busy that’s why I didn’t hear from you. The metal ice trays I would have to hunt for since the one in the pic is over twenty years and I haven’t seen any like that one for quite a long time. @ Blackinese you can use vanilla essence. I found the metal ice tray on amazon!! In hawaii, coconut is haupia — i’m going to make these as i think my hubby will like them as much as i think i will!! they sound absolutely yummy! MMMM good! again , thank you Mr. Felix , I sure am enjoying these ice cream blocks . I’ve searched the web some time ago looking for a recipe , even asked folks but to no avail until now . 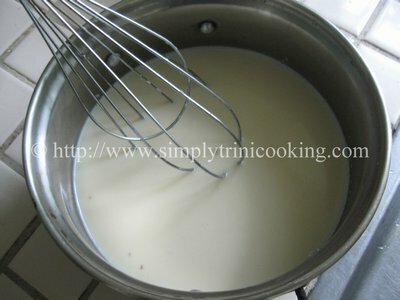 Well u know , I made some coconut milk yesterday and made the drops( which turned into muffins ) and while looking around I found this recipe and am oh so glad because they are delicious …… onto fry rice ….yea , b4 I get to the pepper roti cause I dont know where to find the beni plant ….any ideas ? I’m in boston.